Why we stormed Melaye’s house – Police – Royal Times of Nigeria. 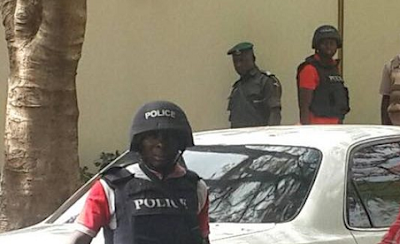 The police said on Monday night that the siege on Senator Dino Melaye’s residence was necessitated by his involvement in a case of unlawful possession of prohibited firearms. Speaking with The Nation, the Force Deputy Spokesman, Adeniran Aremu, said, “Our action was prompted by the fact that he was invited in a case of unlawful possession of firearms and other crimes.